The small ion fan operate simply and its size is small and weight is light . Small ionizing fan I uses high frequency corona discharge, so the positive and negative ion balance is good, which can eliminate electrostatic effect excellently. 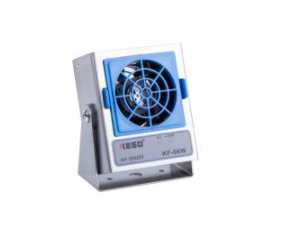 Small ion fan is suitable for electronic components, plastics and film industries, which is through the discharge of the corona discharge discharge, the resulting ionization of air from the fan blowing, and can neutral with the static objects, so as to achieve the purpose of preventing electrostatic disasters. 1. The front panel is fast and easy to clean and maintain the internal discharge needle. 2. Small and lightweight, can be used for equipment into the table, the use of table and production line settings. 3. High-precision ion balance: the error below ± 5V, with self-regulation function. 4. Front panel with rectification, can quickly eliminate near or far from the static electricity. 5. The use of high-frequency corona discharge, so positive and negative ions is difficult to disappear, the most suitable for the surface of the uneven product static elimination. 6. In the abnormal situation, the output alarm signal. 7. Piezoelectric transformers save energy.